How nonprofit organizations can raise funds while focusing on achieving their mission? I mean, fundraising is time, energy and resource consuming. While fundraisers are necessary evils, many organizations struggle with allocating the right amount of resources. Not to mention how overwhelming this process can be. I have been talking with many nonprofits trying to figure out what’s the real deal with fundraising. What or who is the bottleneck. What keeps many of you awake at night. And I have come up with some ideas on creating promotional custom apparel products that can raise funds while you sleep all year long. Make a connection between the mission and affinity. With peace of mind, outsourcing let you focus on your mission. Nonprofit organizations often spend a lot of money on custom apparel, such as T-shirts, caps and jackets with their logo. Either to give away to donors or participants (for example, logo tee-shirts for charity runners) or to sell to make a profit that goes towards their cause. Custom apparel is so popular with nonprofits because volunteers and donors like having some recognition of their charitable deeds, and these items can be powerful incentives to get involved or donate. The connection between mission and affinity create a huge bonus for nonprofits when it comes to the use of promotional apparel. A commercial won’t sit on your supporter’s desk or workbench or kitchen table for all to see. Your supporter cannot use your magazine advertisement or highway billboard to display his or her personal affinity for your mission (some have tried you might say!). An article of clothing with your logo is a personal item – used, noticed and remembered. It’s a fact that about 80% of promotional apparel is purchased by for-profit companies. But with the exception of outfits like Apple and Porsche, few companies inspire such brand loyalty that someone will prize an item of clothing with their logo. You may own a Mazda, use a GE refrigerator and patronize MacDonald’s. You may wear Reebok sneakers and prefer Bloomingdale’s to Macy’s. But right now, as you read this, there is little chance you can see anyone wearing a shirt or cap with a Mazda or GE or McDonald’s or Bloomingdale’s logo. By contrast, there is a very good chance that people who support a good cause, like a breast cancer charity, forest protection fund or organization that supports local underprivileged schools, would happily wear an item with the logo of that favorite nonprofit as they go about their day, or even in the workplace. Affinity makes custom apparel an even better branding investment for nonprofits because those items are kept, used, displayed and prized as functional statements of personal affinity. Mission drives affinity and affinity drives the use of products that display a supporter’s commitment to the mission. The perceived value of the item also contributed to whether the recipient had a more favorable view of the gifting organization after receiving a promotional item. People who received an item perceived to cost more than $25 had a more positive attitude to the giver after receiving the promotional item; the same was true of 42% of people who received an item perceived to cost $10-25, 41% of people who received an item perceived to cost $5-10, and 28% of people who received an item perceived to cost under $5. 60% of people also said they would keep a perceived “high value” item for more than three years. This suggests that custom apparel, while not the cheapest form of promotional product available on the market, is likely to be appreciated. Will result in a higher opinion of the nonprofit, and be kept and used for multiple years. For your fundraising efforts, custom apparel is thus a better investment than cheaper items like custom pens or stationery. All that said, designing, sourcing, and fulfilling custom apparel orders can be time-consuming, expensive and almost impossible to do on your own for smaller and mid-size nonprofits that want to keep their overhead down. Storing apparel requires empty space and time to stock merchandise and keep track of inventory. Selling or giving away items requires availability and time from staff or volunteers to package and ship items. 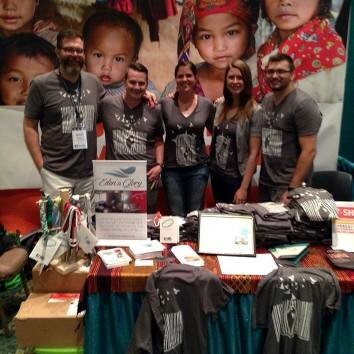 In short, producing and distributing custom apparel for your nonprofit can easily end up taking your staff and volunteers away from their real mission, and tie up valuable space and time that could be better used in other ways. Experts in custom apparel production and distribution, bydfault.com offers end-to-end fulfillment of all their extensive selection of customizable products. They will store your nonprofit’s personalized products in their safe warehouse, providing real time inventory management. They can also open an e-shop for your organization to make your products available for purchase to your supporters, saving you the hassle of ensuring security and compliance. Bydfault.com also gives you the tools to monitor your sales and better understand what is selling and where your clients are located. Outsourcing your custom apparel needs allows your organization to focus instead on your mission, saving you time, space and money throughout the process – and there’s another major bonus to working with bydfault. Bydfault is committed to being an ethical company, and sources only ethical products from ethical suppliers. That means no scandals for your nonprofit! They are also committed to giving back 5% of your order to a charity of your choice – most likely, your own! There’s no question – custom apparel is an ideal promotional product or giveaway for nonprofit organization. Outsourcing your custom apparel needs through bydfault allows you an ethical and easy way to offer these products that saves you time, money and space. What more do you need to know to get started creating promotional apparel with bydfault.com today?